Our friends at Xotic recently sent us a box of pedals and asked that we build them an Xotic demo pedalboard for our shop. 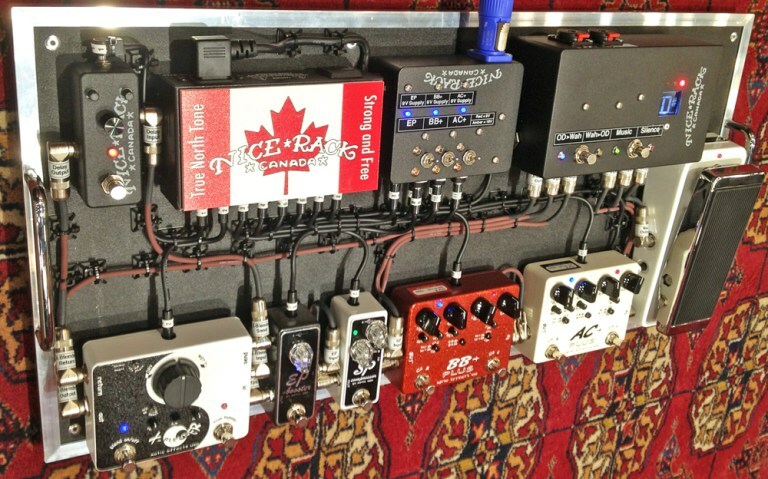 When our customers visit Nice Rack Canada they can experience the sweetness of an Xotic tone taste test. Featured on this board is the Xotic Wah, AC+ Distortion, BB+ Overdrive, EP Boost, SP Compressor & X-Blender Parallel/Series Effects Loop. Xotic’s harmonic reach devices can produce entirely new ranges when powered at 18VDC. Utilizing the Xotic Voltage Doubler, we built up a custom solution with switching circuit for demonstrating the difference between 9V & 18VDC sources to the pedal. To further extend the tonal range of the pedals when combining Wah & Distortion / Overdrive, we built up a Order Reversing Switching Circuit to place the Wah before or after the Distortion & OD stages. This pedalboard is powered by the father of all pedalboard power supplies, the Voodoo Lab Pedal Power 2+. If you haven’t had a chance to get a taste of the Xotic brand yet, let us take you on a guided tour to tone heaven. Contact us for your appointment today.